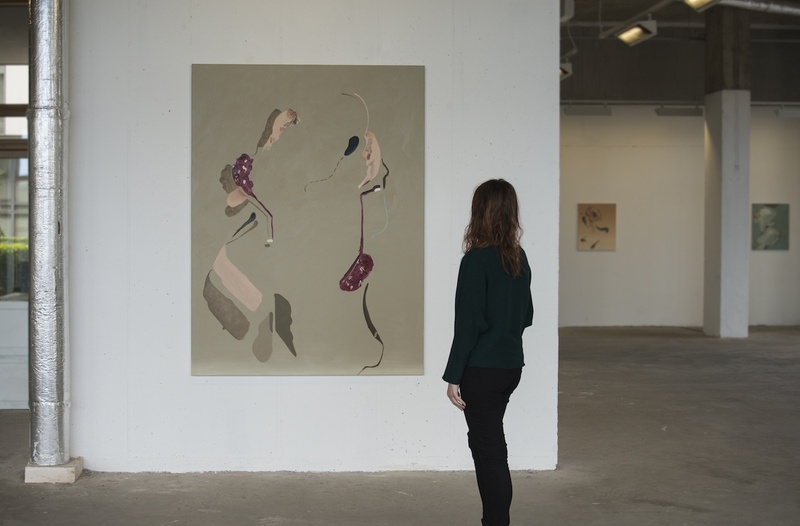 Damien Flood, Parting, 2016, oil on canvas, 180 x 140 cm, installation shot of ‘A Root that Turns as the Sun Turns’ at Green on Red Gallery, Dublin, photograph courtesy of the artist. ‘A Root that Turns as the Sun Turns’, a new series of paintings by Damien Flood, is a somewhat melancholic celebration in the haziness of memory, and in the moments of solidity amidst this haziness. Common to all the paintings in this series are forms that offer varying levels of withdrawal and distance from the memories that informed them. They appear like living fossils, symbiotically tied to each other and to the unconscious from which they seem to emerge. They give this unconscious a body and a life to populate, both inside and outside the frame, and in the lived experience the viewer brings to it. These forms embrace a coming together, though it is not a coalescence achieved through any conventional logic. They seem to move through paralogical relations, exceeding quantitative connexion and the very need for a representational epicentre. Fleeting resemblances do persist, although these instances seem more catalystic than anything else. At times these paintings carefully touch off the representational, but in the service of plurality and movement, rather than fixed resemblance. These are glimpses of the delimiting territories that permeate this body of work, but this is where representation ends in ‘A Root that Turns as the Sun Turns’: right at the beginning.